Defining, transforming and directing, Stromberg permanent GFRC bollards add definition, and help to outline your space. Glass fiber reinforced concrete bollards are an excellent choice for many applications. Stromberg Glass Fiber Reinforced Concrete bollards are made of Portland cement, crushed stone, silica sand and polymers reinforced with glass fiber and structural reinforcing as required; they are asbestos free. Stromberg transforms the ordinary bollard into a quality architectural attribute. Stromberg bollards in GFRC can be in the form of posts, planters, balls and various other forms, and can be used to restrict and direct motor vehicle traffic as well as provide for and enhance the safety of pedestrians. Stromberg GFRC bollards come in a wide variety of shapes and sizes. They can be surface mounted or built into the ground. A surface mounted bollard in GFRC is bolted or fastened onto an existing structure such as a foundation floor or a walkway. This glass fiber reinforced concrete bollard is reinforced with fiberglass and is lightweight while also being durable and resistant to the elements. A GFRC bollard that is built into the ground is formed to fit onto an existing structure or mounting location; it makes a serviceable architectural element that will last for many years. Stromberg GFRC bollards are made in many shapes and sizes; they can have a graceful and precise look, yet be functional and add an attention grabbing aspect to any space. Stromberg produces bollards in many different textures, colors and finishes as well, all with the quality for which they have become known. Contemporary bollard styles in GFRC are offered by Stromberg and are often used in commercial settings, intersections and government buildings. Contemporary bollard styles offer clean lines and simple shapes and add a professional quality to any designated area. Classic bollard styles in glass fiber reinforced concrete with fluted details and finials are also offered by Stromberg and are popular in educational and ecclesiastical settings. They can also be used effectively in storefronts, landscape environments and malls. Illuminated GFRC bollards are often used in areas where security is a concern and extra lighting is needed such as pathways, sports fields and leisure parks. GFRC bollards can be made in several different finishes and colors. Glass fiber reinforced concrete bollards are rustproof and submersible. 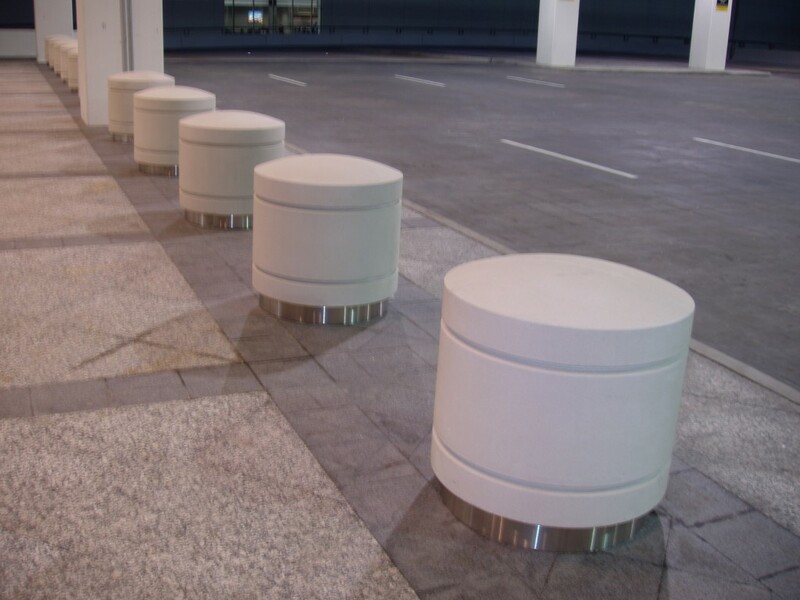 GFRC bollards can be cast in many sizes and shapes to fit your application. Glass fiber reinforced concrete bollards can be custom designed to suit your needs. GFRC is much lighter than stone, but is also durable. Glass fiber reinforced concrete bollards are easily installed. GFRC covering is weather-resistant and fireproof. The professionals at Stromberg Architectural products offer their expertise every step of the way in your GFRC project. Visit Stromberg Architectural Products for design assistance, CAD details and specifications, or call (903) 454-0904. The initial consultation is free. © 2012 The Stromberg Group. All Rights Reserved.